Heat oven to 425°. Pour water over cranberries in 1-quart microwavable dish; cover with plastic wrap, folding back one side to vent. Microwave on High 1 minute. Uncover cranberries; cool. Mix Bisquick mix, sugar and cinnamon in large bowl. Cut in 3 tablespoons butter, using pastry blender or crisscrossing 2 knives, until mixture looks like fine crumbs. 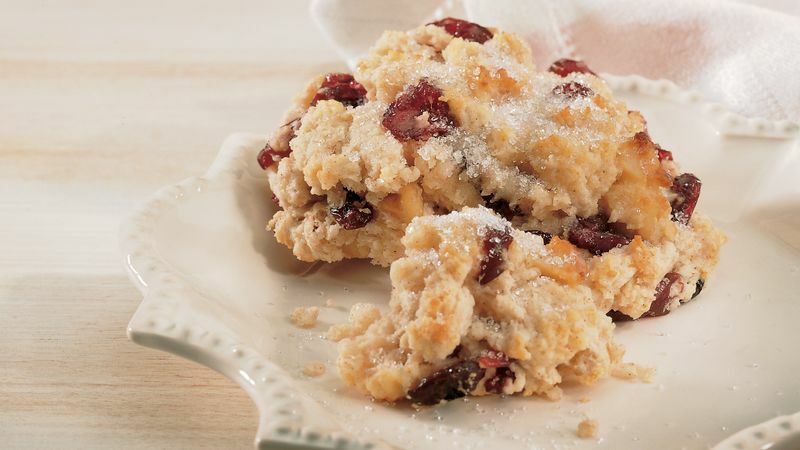 Stir in butter-milk, vanilla, cranberries and walnuts just until moistened. Drop dough by 1/4 cupfuls onto ungreased cookie sheet. Sprinkle with additional sugar if desired. Bake 10 to 11 minutes or until golden brown. Brush 1 tablespoon melted butter over warm scones and sprinkle with sugar if desired. To store, wrap cooled scones tightly and freeze for up to 2 months; to reheat, microwave on High for 30 to 35 seconds.